How can you be so ridiculous? You think you can just sit there and taunt me with your Wonder Bread print? Listen man, you win. I want you! I think you are exactly everything I've wanted but have been too afraid to ask for. Come to me pants, let me wear you while I engage in summer shenanigans. I LONG FOR YOU. Ohhhhhh, you beat me to them! I totally had these on my 'to blog' list! LOL "wonderbread". 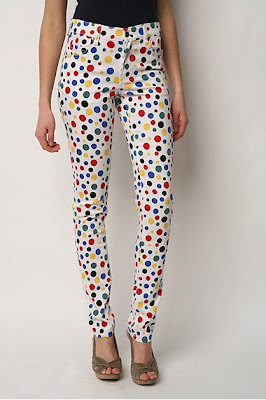 Cheap Monday lost their marbles (in a good way) and they've spilled onto some white jeans. I LOVE IT. These will look so great on you. Clown pants, are we kidding here ladies? C'mon. Hahhaha. I love it, the Wonder Bread print. I want a pair! Kimmy Gibler wore these jeans 15yrs ago!